Nyepi is a one of a kind new year celebration celebrated by the balinese hindus. Nyepi consists a whole week of ceremonies some preparing for it, Nyepi day itself and ceremonies after the sacred day of silence. This is a busy week for the balinese people but gives a great sneak peek to the rest of us of how balinese hinduism that controls a major part of the islands life is actually like. Indonesia is the biggest muslim country in the world it still recognises it's hindus and has one public holiday for all its citizens during Nyepi week. 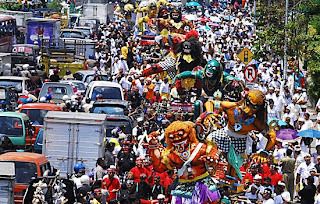 Luckily for those who live in Bali it's a unique holy week that the islands visitors have a special opportunity to witness. This week has an impact to everyones lives staying on the island even the casual tourist will have to respect this ceremony week. This year Nyepi landed on the 12th March same time as the students mid-semester break. Melasti the cleaning of the statue, usually takes place 3-4 days before Nyepi, is a ceremony about cleaning all natures content to help the people become more closer to the gods. God statues from all the village temples are taken down to the river in a colourful parade to be washed, purified. Melasti ceremony is performed in Pura Segara which means near the sea. Tawur Kesanga, the day before Nyepi, balinese people return to their own villages to spend the rest of the week with their family and relatives. The streets fill up with big demonic looking statues called ogoh-ogohs that demonstrate the evil spirits. After these evil statues have been taken around the village the Ngrupuk ceremony takes place where the ogoh-ogohs are burned to get rid off all the bad spirits. 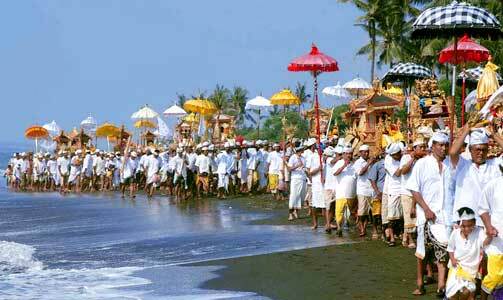 This is the last preparation before Nyepi. 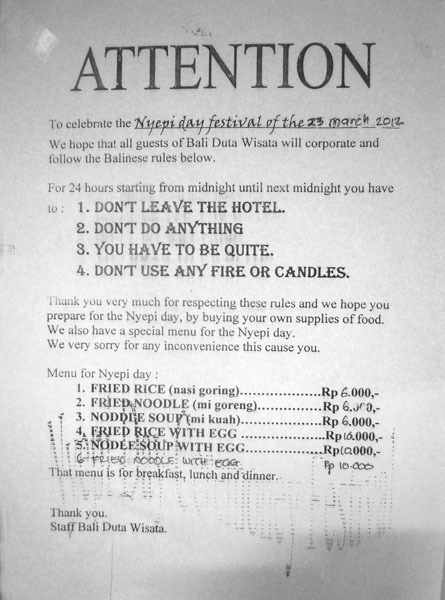 Nyepi, the day of silence, is exactly what it means. There's no one out on the streets anywhere in Bali, not even tourists are allowed to leave their hotels nor villas. Only pecalangs, the traditional balinese security men are allowed to be outside, walk around making sure everyone obeys the rules of this sacred day. The no moving outside rule also includes all traveling during Nyepi. This means there are no flights no boats no transportation coming in or going out of Bali. Also electricity such forms as lights are kept to minimum and no television or radio is allowed. Hotels offer special Nyepi packages that can be an interesting option for those who don't want to go all in to this balinese tradition. For many students living in villas will need to go by the given rules. It's an experience that doesn't come around often. The main purpose of Nyepi is to hide from the evil spirits that were burned to ashes the previous day during Tawur Kesanga. Staying quiet in the dark not making any extra noise is a disguise for the evil so it will fly past Bali thinking there's no one there. It's also a day for deeper thinking into those values one wants to carry with them in the future. The day after Nyepi is Ngempak Geni which is a day about forgiveness and letting old bad things go in all levels both people and societies. Balinese people go for visits in other villages and friends and families to let go of the past and focus on those values they have decided to carry with themselves from now on.